We are delighted to announce Dulwich Hamlet Football Club have chosen Redthread as their charity partner for the 2018/19 season. DHFC will be raising awareness and funds for the Redthread throughout the year. Traditionally based at Champion Hill, East Dulwich (but temporarily playing at Tooting & Mitcham) each year the football chooses a local charity to benefit from various initiatives across the season. These include raffles, promotional events and coverage on the website, match day programme and social media channels. For the second year running, there will be a Christmas card competition launched for primary school children. Redthread began as a Youth Club in Dulwich back in 1995, and since then has developed into a network of programmes across London and the Midlands. Redthread’s projects at King’s College Hospital and St Georges Hospital being close to where DHFC used to and currently play. 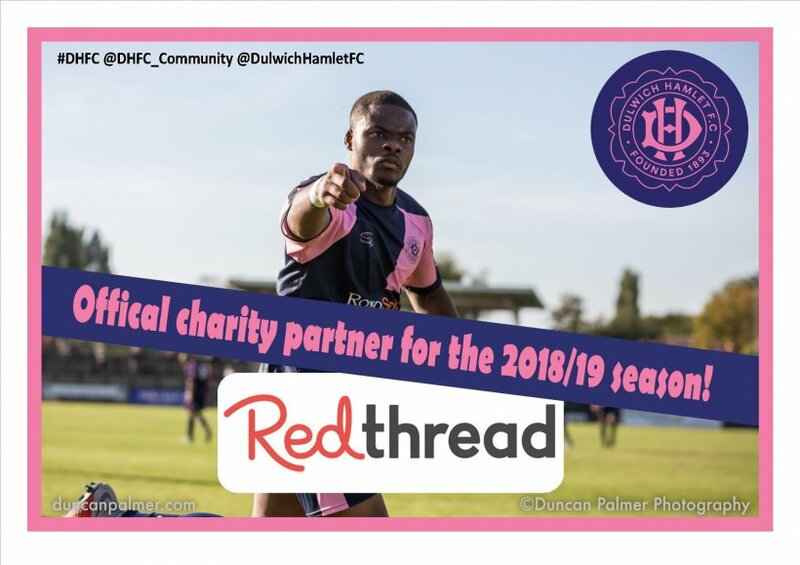 John Poyton, Redthread CEO, said: We are delighted that Dulwich Hamlet Football Club have chosen Redthread as their charity partner for the season. We look forward to working together and this is a great opportunity for Redthread to build relationships in the local community.